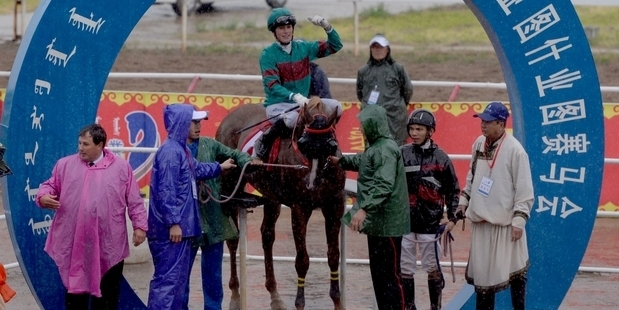 Alex Forbes celebrates riding a winner for father Graeme at Khorchin in Inner Mongolia. Father-and-son trainer-jockey partnership Graeme and Alex Forbes are giving them a taste of Kiwi in Inner Mongolia. The Forbeses combined to claim the feature sprint at the most recent Khorchin meeting and have their eyes on far bigger spoils as the racing season in China begins to heat up. Graeme Forbes has been based in Khorchin for just over a year and last year finished third on the trainers' premiership with nine wins, three behind a specialist trotting trainer, whom the galloping trainers have to compete with on even terms. He won the Khorchin Derby with a New Zealand-bred son of Iffraaj and believes he has the firepower for premiership honours this season. "I was pretty happy with my first year," the former Cambridge horseman said. "We've bought some nice horses and we had a shipment come up in January and another shipment come up in May. Fingers crossed we'll have a couple of good ones come up out of them." Alex Forbes has been in China for the past three weeks but wasted no time getting into the winner's circle, leading throughout on a Highview Stud-bred galloper by Align in an 1130m event. "It was the biggest race of the day, so the biggest prize money, so I was pretty happy," said Forbes. "I had my first go on a trotter the other day and it just got beat as well. It was pretty interesting. The track is quite tight, a little bit like Te Awamutu. Racing is pretty much life for us up here but I'm really enjoying it." The Khorchin racing scene is an emerging market for New Zealand-bred horses, thoroughbreds and standardbreds, backed by Inner Mongolia Rider Horse Industry boss Lang Ling, a Manchurian business magnate. "It's going great. Things are looking really good. Mr Lang is a good operator and he's got big ambitions for everything up here. It's come along well," Graeme Forbes said. "Mr Lang loves New Zealand. He's probably bought close to 550 horses through the last 18 months out of New Zealand and he's signed a contract to buy four plane-loads from this September to September next year and we can get up to 87 horses on a plane. "We sell a lot of horses, too. He's in the market of racing them but our main goal is to try and get them looking good and sell them to owners within China." Forbes said he met Lang through Highview Stud boss Brent Gillovic which led to him becoming one of just five international trainers at Khorchin. He has 26 horses in work, including some standardbreds, and intends building that up to the maximum allotment of 30 in the coming weeks. Horses train on a 1000m sand track, which is often blanketed in snow in winter. Race distances are restricted to 1130m, 2130m, 3130m and 5130m, though a new track is planned for next year which will cater for races of 1200m, 1400m 1600m, 2000m and 2200m. "The stakes are getting bigger and bigger. Next year some of the races will have stakes of $200,000," Forbes said. "There's no gambling but if it opens up, it will be phenomenal. It'll be really big and the money will go up. "I love it up here. It's quite good having Alex here too, someone else to talk to. It's a shame the boss doesn't speak much English because he's so enthusiastic about racing and especially New Zealand. He loves New Zealand people and New Zealand horses." Forbes has his first winner of the season primed for the next feature meeting at Khorchin on June 28. "Hopefully he can do it again," Forbes said. "It was a great front-running ride from Alex last time." Racing at Khorchin runs from early June to late August before trainers join the China Racing Association circuit, travelling to other tracks, leading up to the coveted Wuhan meeting in Central China at the end of October.